We've seen some encouraging growth of Communities of Practice at Defra over the last year since Emily Webber got them started, helped by support from our new joint CDOs and by a great deal of enthusiasm on the ground. 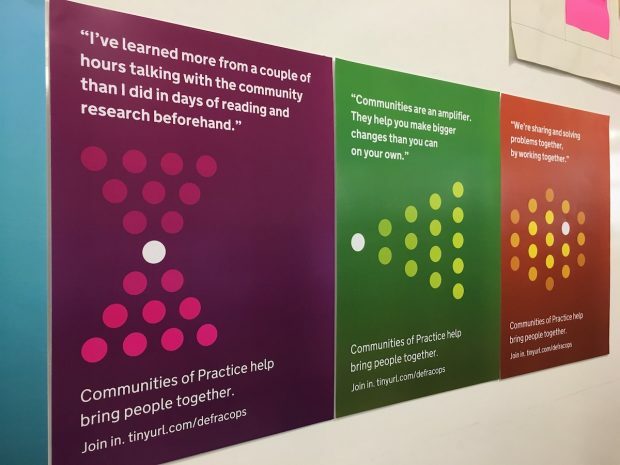 On a recent catch-up call, members of a few of the communities said: "We want to expand our Community of Practice and get more members to join in, but it's hard to get the word out, to reach across Defra group. People don't know that we're here." We decided to do something about that, and came up with a set of posters to spread the word. They’re really lovely, so we thought we should share them. Adopting the principle of "show, don't tell", we thought it would be best to let members of the various Communities of Practice speak for themselves. With a bit of pestering via Slack and Google Docs, we asked members to contribute their answers to a simple question: "Why are communities a good idea?" We then started turning the best of those answers into a set of posters, with help from designer Liam McMurray and writer Giles Turnbull. Liam created a visual theme that brings them together, so that they work as a set and as individual messages. 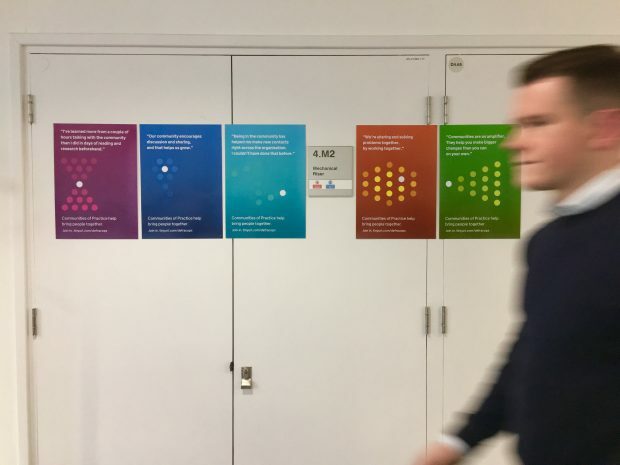 The entire project was inspired and influenced by the stages of service design posters designed by Eliot Hill from Home Office Digital, which have been going up on various Defra walls recently. We hope people all over government will find these new communities posters equally useful.